The Argo Program has achieved 13 years of global coverage, growing from a very sparse global array of 1000 profiling floats in 2004 to more than 3000 instruments from late 2007 to the present. A basic description of the modern upper ocean based entirely on Argo data is available here, to provide a baseline for comparison with past datasets and with ongoing Argo data, to test the adequacy of Argo sampling of large-scale variability, and to examine the consistency of the Argo dataset with related ocean observations from other programs. This new version of the Roemmich-Gilson Argo Climatology extends the analysis of Argo-only derived temperature and salinity fields through 2016. Several marginal seas and the Artic Oean have been added. The analysis method is similar to what was descibed in the Progress In Oceanography Roemmich and Gilson paper (2009). The only modification has been to scale the zonal equatorial correlation of the optimal estimation step, by 8 times, versus 4 times as in the 2009 paper. The additional Argo data utilized in the analysis results in a longer monthly record as well as better estimates of the mean and variability fields. Monthly updates are available in between major yearly re-analyses. Timeseries of 0-2000dbar Global-Average Open Ocean Potential Temperature (oC) (Spatial mask defined within RG netCDF file. 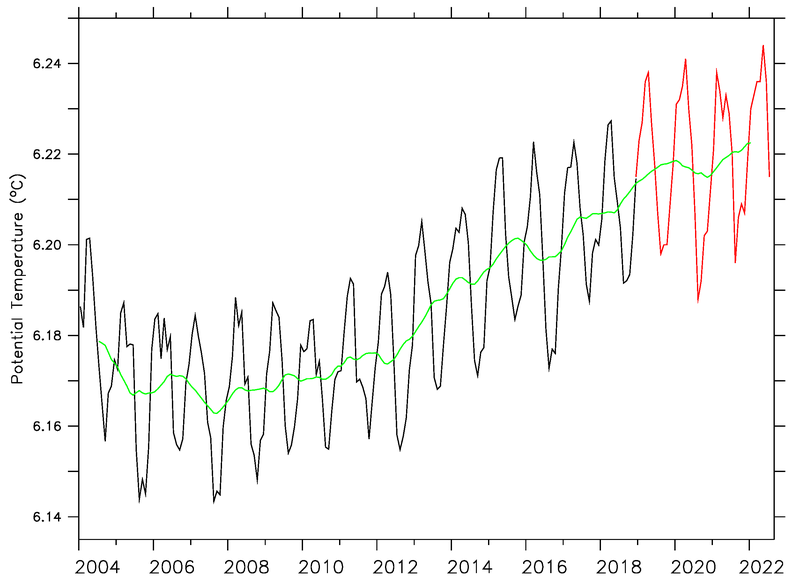 Marginal Seas and the Arctic Ocean are excluded from the calculation) over the 156 months of the RG Climatology (2004-2016) [black line] and 2017/2018 monthly extensions [red line]. The 12-Month box-car average is shown in green. Monthly updates temporally extend the RG Argo Climatology (2004-2016). Data from 2017 is not used in determining the most recent RG Argo Climatology (above). Pressure averaged (0-2000dbar) Potential Temperature Anomaly (oC) from the latest monthly RG Extension. The Anomaly is defined relative to the RG 2017 annual cycle. The RG Argo Climatology uses a weighted least-squares fit to the nearest 100 Argo profiles within a given month to estimate the mean field. This method can result in small spatial scale features being muted if the nearest Argo points span an area larger than the feature. By reducing the number of Argo profiles used in the least squares fit, smaller scale features can be retained with the tradeoff being larger uncertainties. Here are estimates of the temperature and salinity, 2004-2016 mean and 2004-2016 annual cycle fields, derived by using 1/3 the Argo profiles (nearest 33 profiles per month) in the least-squares fit. All other methods, including the optimal interpolation, remain the same as the RG Argo Climatology. The mean field (no temporal variablity) is reported at a resolution of 1/6 by 1/6 degree. The annual cycle is reported at a resolution of 1/2 by 1/2 degree. The files available at this website are in netCDF format, a binary storage medium. They are not CF compliant. Recommended tools to use and manipulate the files include the Global Marine Argo Atlas, Ferret, or Matlab. For additional support, please contact John Gilson (jgilson@ucsd.edu).